The students of SHSS are the top percent of high school students among the top percent. 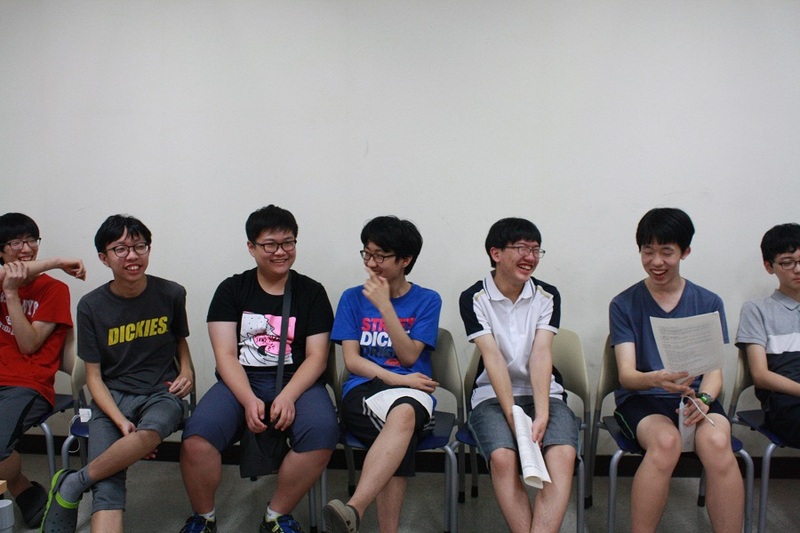 They are the few who made it into one of the most competitive schools in South Korea. These students have so little time to be kids, yet they still try. In the 10 minutes before class starts, a group of boys in bowl cuts with pimpled, bespectacled faces rush around the classroom. They grab at each other and kick off the walls. They jump across desks, scream and laugh. They kid around and, they punch each other’s arms, just like many kids their age. For the time they are allowed, they are just kids being kids. These are the young students selected from the top 0.01 percent of all middle school students. A school in Korea is often ranked by how many students get accepted to top Korean universities. In 2016, 129 SSHS high school graduates entered college. They have to be recommended by their teacher in middle school to even qualify for SHSS’s placement exams. SSHS’s 389 students are among Korea’s brightest. SSHS’s students aren’t unaware of their own special place in the Korean education system. Hwang said his parents felt that, upon his acceptance to SSHS, he was already halfway to getting into a good college. Impenetrable and imposing, the school’s main red brick building, built in 1989, looks like it could have come out of a 90’s cartoon. The school has since added two modern glass towers, which shoot out of it to its right side and front. This is where students spend most of their days and nights. They are not in uniform like many other high school students in South Korea. Instead, they are dressed in t-shirts and shorts or jeans. Their desks are covered in doodles, of cartoon faces with sharpened chins, of panels and illustrations the length of a comic book page. The bare white walls are left with scuff marks and dirty shoe prints just above knee height from hundreds of kicks every day before class. Class runs from 8:30 a.m. to 4:10 p.m. After class, students can be found in the school’s self-study room, buried in their laptops or books. Then by around 10:30 p.m., most students are back in their dorms, where they study until 1 or 2 a.m.
”I always sleep at 1:00 (a.m.), and I always get up at 7:00,” said First Year Student Sang Hoon Oh. At times, rigorous studying takes its toll. South Korea is known for its high rate of suicide. A report in 2013 by Statistics Korea, a Korean government run statistics office, said that in 2013 suicide was the leading cause of death for those aged 9 to 24, with a rate of 7.8 per 100,000 young people. The report also stated that 61.4 percent of young people aged from 13 to 24 dealt with chronic stress in 2014. Young people cited in the study said the stress was mainly school related. Second Year Student Lee Hanjun said that students are screened for emotional problems before arriving at school. Then each student is assigned one of several counselors. These counselors watch the students during their stay at the school, and might recommend students to take time off if they are becoming overly stressed. No wonder the school’s drop rate is relatively low. SSHS teacher Hyejin Chang said that only one student dropped out in 2015 and that no students have dropped out from school in 2016. Many students who stay also know that graduating from SSHS means you already have a leg up among competition to get into college. Sungmin Ha, a ‘93 graduate, is one of those students. He studied industrial management at the Korean Advanced Institute of Science and Technology (KAIST), the only non-U.S. school to rank within the top 10 of Reuters Top 100 World’s Most Innovative Universities list – just eight slots under the Massachusetts Institute of Technology (MIT). Now he is a manager at Riot Games, a popular video game developer responsible for League of Legends. Not only does the degree give these “geniuses” a leg up, but the facility also houses scientific hardware usually found at a research university. Take the Nuclear Magnetic Resonance Laboratory. To enter, students have to remove anything such as credit cards with magnetic materials. The school also has a 3D printer and a multi-channel spectrophotometer worth nearly $30,000. Meanwhile, there are relatively few female students compared to male students who get to enjoy these amenities. Ha said that when he attended SSHS from 1991 to 1993, the school hovered at a female student population of 20%. Not much has changed since then. Only recently was their first female student body president elected. The few girls who attend SSHS sleep on the first floor of the dormitories, while the boys sleep in the next two floors. But girls are still on the minds of these young men. When asked if they have time for girls or girlfriends with all the time they spend studying, they were first quiet. Some of them leaned over and whispered to their neighbors. One young man looked down, his face flushed tomato red. They giggle at the thought of girls, but they are the kids who work like adults. These students just ended one school year in July, but after only one month, in August, they will be back in the classroom. In school, time is measured in hours of lecture, not so much in years, but these first year students still have two more years to go before they are released on the world. These are the same students who expect to have big futures. Student Kyum Park wants to do research and R&D projects. Hwang wants to be a physicist. But there are others, like Oh, who aren’t very sure just yet what they want to do or who they want to be. And while they have time to figure that out, their exhaustive studying drives them ever closer to adulthood, but their futures are still far ahead of them.